Turn Your Pool into a “Dive-in” Theater! - SE Pool Supply & Chemical Inc. Turn Your Pool into a “Dive-in” Theater! Nothing is more fun for the entire family than a trip to the movies. Well, maybe a drive-in movie. Or wait, how about a “dive-in” movie? Imagine a pool party combined with movie night. It’s the best of both worlds! Trying to come up with a fabulous birthday party idea, or just want to shake things up w bit? Consider a dive-in pool party. Simply plug in your big screen television outside (far enough away from any water splashes of course). 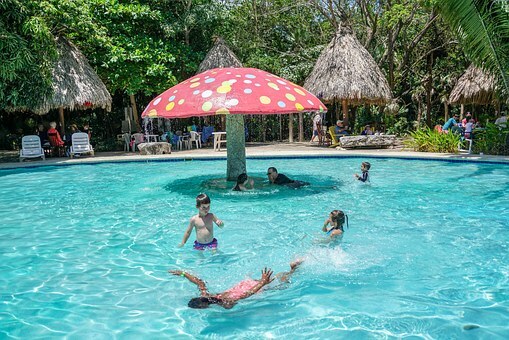 You can enjoy a pool party, complete with all the pool games, fun and food, while you are watching your favorite flicks! Choose classics like Casablanca and Breakfast at Tiffany’s for girls’ night, Little Mermaid, and Aladdin for the little ones or the latest and greatest movies for everyone to enjoy. Then invite your all your kids friends – or your friends for that matter – over for the pool party of the century! Everything can tie into the theme. Your invites could look like movie tickets and you can serve freshly popped popcorn, candy and other movie-type treats! What a fun time for all – whether it’s your whole family, all your kids’ friends or a bunch of your friends. Come to SE Pool and Spa if you need any great pool games or accessories for your event. The End!